White House Christmas Tree Arrives Days Early Because Trumps Will Be At Mar-A-Lago For Thanksgiving - Joe.My.God. 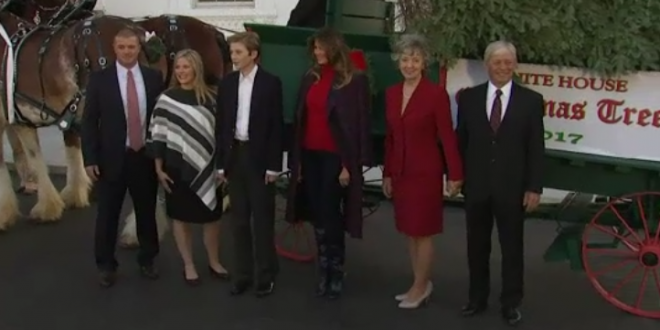 Melania Trump, and son Barron, continued a time-honored, first lady tradition on Monday: receiving the official White House Christmas tree. A military band quartet played holiday tunes as a horse-drawn wagon carried the 19 1/2-foot Balsam fir from Wisconsin up the White House driveway. The tree usually arrives the day after Thanksgiving, but was delivered early this year to accommodate the Trumps, who are spending the holiday at their estate in Palm Beach, Florida.